This season I have decided to expand our MLS draft coverage and try to provide what you can expect from similar type of NHL, NBA, or NFL coverage. I started collecting, scouting, and tabulating American youth and college information because of the poor quality of information, available both through media sources and the MLS head office. What I have come to learn is despite the large number of players who join the league through the draft, pre-scouting and analysis is not given a large amount of attention and the draft seems to be more hoping than anything else that the pick will turn into something tangible. If anybody has read the book Moneyball, or follow sports closely, they will know that a good draft could be huge step of creating a successful team on the field. If you look at the teams in MLS who have either turned their season around or are consistent winners, how they drafted either through scouting or fluke has played a major role. Personally, I have had good success in soccer, including past MLS drafts, in spotting successful players primarily based on how they performed during there career so far. In the case of the MLS Draft, most players have played a number of games during Youth and High School leagues, more recently in College, and many cases playing the summer in the Pro Development League. I've already written in fair detail about many potential 2014 MLS Draft picks in my college articles and those who have had a chance to read these will be familiar with many players in the draft. To start this year’s coverage I thought it be best to look at the top 25 prospects in the draft. Unfortunately, the 2014 SuperDraft doesn't have a large amount of players with huge potential, however, all players on the list can play a role on a MLS club if given the right opportunities and used correctly. It's very rare to have the top prospect a goalkeeper, especially in relation to the draft where more than half of the clubs in the MLS are fairly happy with their keepers. In terms of value and long term upside Andre Blake is my top prospect in the draft. 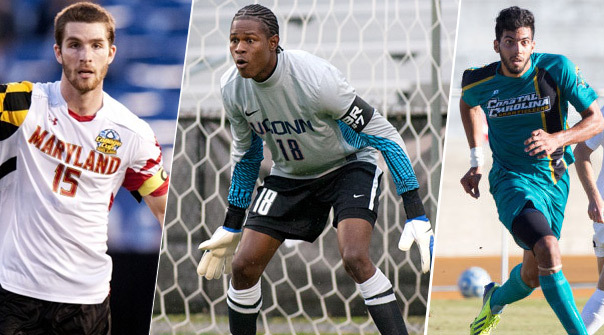 The Jamaican keeper has good size at 6'4 and has done well during his three seasons at UCONN. What puts him number one is I've already heard people in large European leagues discuss him and if MLS did not give him a GA contract, he probably would of left school for a spot in Europe. Signed very late as a GA, although he is regarded as one of the top prospects in college soccer during the 2013 season. Dean has all the tools you want to see in a potential great centre back - 6'3/198, athleticism, National Team experience and with California being one of top teams during this past season, he was easily in the view of many scouts. He still needs to learn more about the game tactically, and to be honest, other centre backs in the draft are more pro ready, although Dean's potential will make it very difficult for clubs not to pick him. In my opinion, most people have been very hard on Neumann, with most criticism regarding his athleticism. To me Neumann has shown certain skills, mainly his ability to generate scoring opportunities from outside the 18 yard box, that if used correctly I think he could be a huge asset to a MLS club. I see Neumann playing the popular role of an attacking midfielder off the wing who has the ability of running in and scoring from just outside the box, which has made Gareth Bale and a few others very popular. The evaluation of Mullins asks one of the most difficult questions in trying rate a player: can his college success be duplicated at the MLS level? No one can argue with Mullins statistical output, which included 35 goals, 15 assists, 91 shots on target just over the past two seasons. The issue becomes will he be given the same chances via playing time and position to make a similar impact in the pros? One fit that could work out is if DC United draft him first and use him to replace the recently departed Dwayne De Rosario. A highly touted sophomore, based of his success in the US Youth National Team, continued to impress in college with two successful seasons at Louisville. Hariston, who was given a General Adidas contract, will be one of the youngest player in the draft at 19. He is regarded as a classic box-to-box midfielder who likes to be active with and without the ball. Overall, his size and skills are not exceptional, and he will need to improve his strength to handle the pro game, but should be useful to an MLS club in a number of positions. Cochrane was always on the radar for being a potential GA pick, and despite this draft already having a number centre backs available, the fact Cochrane’s salary will not count against the cap will make it very difficult for teams to pass on him. Cochrane, like Dean, ticks all the boxes in terms of size - 6'3/195 and strength, although not as athletic as Dean he does have more experience with the US National Team program. In regards to making an impact in 2014 I might prefer seniors Venter, Birnbuam, Cope or Hagglund who seem to be more pro ready. For a couple of years Venter has been one of the more pro ready players in the college game. He has great size and strength, and at 6'3/190 he has shown an ability to win most aerial confrontations and score a header on set plays. Like the question regarding most centre backs, the issue is teaching him greater awareness while under pressure instead of just using his instincts. As well, some could question his leadership capabilities compared to the other highly regarded centre backs in the draft, but he should have a long MLS career. Being injured and missing most of the 2012 season meant Birnbum wasn't on many draft boards preseason. I had him going in the 3rd round or later, however, Birnbuam had an incredible 2013 season leading his California Golden Bears to top of the polls, scoring ten goals in the process, all while playing predominately as a centre back. He isn't as athletic as other defenders in the draft and none of his goals were headers, but he has intangibles such as leadership, good instincts and determination and it will be interesting to see how this helps him as a pro. You would never talk highly about a player having four red cards, although in the case of Jared Watts his willingness to get stuck in and tackle is a skill set that is lacking from most college players since NCAA play tends to be very open. Watts is mostly a defensive midfielder but has some ability to play from box to box, and if he can control some of his aggression that lead to these sending offs in college, he could translate this fearlessness and grit into a long MLS career. Prior to the 2013 college season, Diouf was my top prospect regarding the 2014 MLS Draft. The athletically gifted Senegalese player has shown the ability to score goals, including both headers and from outside the box, but 2013 was a difficult season. First he was injured while UCONN played their weaker schedule, and when healthy only scored two goals in 16 games. He did help lead the Huskies to a deep tournament run and showed an ability to hold the ball and create chances for others. He has potential but is also a risk, especially since he will take up an international spot. A surprise GA pick, Tshuma had a disappointing 2013 season, including disappearing from games completely. Tshuma is known more for his speed than strength, and might be better off playing as a winger, however, he is one of the only players in the draft who will challenge opponents with the ball at his feet. Tshuma scored five goals in 2013 after scoring ten as a freshman and will need to improve his offensive awareness if he is going be useful at the MLS level. Due to his contract and potential he should go fairly high in the draft despite the fact that he will also count as a foreign player. Cope is the only player in the top 25 prospects who changed my opinion through a single performance. The 6'1/175 22 year old centre back was the leader at Michigan State and their success primarily was based on his play and health, including a dominating performance against Georgetown where the Spartans were greatly outplayed but Cope controlled his own box including making highly regarded striker Brandon Allen obsolete. As mentioned, Cope has had injury issues, including missing most of the 2011 season, but if healthy he could become an impact player for a MLS club. I have been high on Ribeiro for a few years and after a successful 2013 season he has started catching the eye of others. Hard to miss the 6'3/208 midfielder, and he is what I feel can be a blueprint for MLS in the development of incredibly strong and athletic players, despite Ribeiro actually being Brazilian. Ribeiro adds additional skills such as the ability to take free kicks and if he is able to use his size to his advantage as he can be a dominant MLS force in the mold of a Yaya Toure. The biggest question regarding Caringi is how do you evaluate his college success based on the weak schedule his school UMBC played against? Coached by his father, Caringi was one of the most clinical strikers in college with 37 career goals including 14 from headers and also scored a number of goals while playing in the PDL. The truth is, by playing at a smaller school he was given more opportunities than others, although in a much more competitive world of MLS, especially in the role of a striker, it’s difficult to judge if he can make a significant impact. Prior to the season, Eric Miller was one of the top potential players to get a GA contract in 2014, although his school Creighton struggled and as other players emerged I didn't expect him to be high priority. Miller can play both defense and midfield with his primary position being right full back. However, his skill set more fits the role of a defensive midfielder due to his play based on more positioning than speed. This being said, full back is a weakness in MLS, so Miller could play that role, especially if his MLS club chooses to use a more defensive back four. Due to style and play of college soccer the role of a traditional 4-4-2 midfielder is very seldom used, although AJ Corrado fits the role of a right midfielder perfectly. Corrado has good speed but is most known for his ability to cross the ball, including his ability to take corners, which has lead to 19 direct assists while playing for Indiana. I don't think he has the size or strength to be a winger, or the shooting ability to be an attacking midfielder, but if a club chooses to play two up front he can be a very useful asset in creating offensive opportunities from the right side. Dillon is an example of a player adapting to a position which could make him very useful for a pro club. Dillon plays the role of a defensive midfielder very well, ignoring the temptation of going out of position to create offense, which allowed his school Georgetown's more offensive players a lot more freedom. Unfortunately, many college players don't have the skills to be valuable offensively and instead have to learn the discipline that Dillon already has to be a useful pro. The fact that Dillon has played this role for four years already, only improves his pro ability. Highly rated going into the 2013 college season, Sherrod might be an example of a player who tried too hard to impress and instead did not show the natural ability that made him standout. A good sized forward at 6'3, Sherrod scored 42 college goals while at Memphis and he also scored a number of goals in the PDL with Portland timbers under-23 side, although he only scored seven (with four of those from the penalty) in 2013. The fact Sherrod is American and clubs are aware of him will help his draft rating but I'm skeptical about players who struggle in their senior season before joining the MLS. To add to the defense depth, Jamaican U20 regular Damion Lowe has been added to the mix given a GA contract. Lowe has more offensive instincts than other defenders in the draft, especially in a full back position scoring both goals in college and with his national team. The two questions regarding Lowe are is he naturally more of a centre back than full back? As well, in college he played at Hartford, a school who plays in a weaker conference so my instincts are that Lowe could be either hit or miss depending on how he adapts to the pro game. He might be the only natural left full-back in the draft, which raises Ben Sweat’s overall status. He has some good attributes, including size at 6'2 and speed, but he doesn't have any great skills that make him stand out. Sweat had a good career at South Florida having a number of responsibilities, including taking free kicks and as a senior a team leader. His MLS longevity will depend on his ability to adapt tactically so he turns into a useful MLS player and not a liability. The Costa Rican winger/second striker can be exciting to watch and could tempt teams to take a shot at him based on potential. His intangibles are also interesting, which includes experience with the Costa Rican Under 18 national team, academic awards and was club captain this season. The issue was, at Akron is he could never translate his skill into a string of consistent performances, and because of this only started 17 of his first 43 games in college. While this season he did start in all 18 games he played in, but only managed 8 goals and 22 shots on target. Bushue played multiple positions during his time at Indiana, although I think skill-wise he translates best as a right full back. He has good defensive awareness to go along with acceptable offensive instincts, which could develop him into a regular MLS starter at this position. I probably would have him rated higher than most because he doesn't have the natural athleticism, but from the times I've seen him play he has shown a tactical awareness. During Indiana’s championship run in 2012 he was very useful in the development of offense from defensive positions. Van de Casteele had MLS potential when recruited by Notre Dame, although it’s been the success of the Irish that has made him climb the draft and prospect charts. A consistent defender, Van de Casteele started all of his 83 college games culminating into the 2013 National College Cup Championship. There has been some thought he can play both centre and full back, although I see him more of a centre back, which works well with his height at 6'2, but he will need to bulk up as currently he is only listed at 165 pounds. Chavez has a lot of positives, as well as concerning factors, in evaluating his MLS potential. On the positive side he was the main offensive force for a high profile school at UCLA, scoring 27 goals and in the process scoring eight goals and adding six assists while as a senior in 2013. The issue is, most likely his best position as pro will be as a winger and is a position that has an abundance of players, however at the same time under utilized in MLS. I can see the team that drafts him primarily using him as a late substitute, which raises concerns over any further development. As a Freshman Aodhan Quinn created most of the offense at Bradley and based on this success transferred to Akron. He was a big name in the college game and talk of potential GA contracts as a Sophomore and Junior. Although his career at Akron never took off and despite scoring 14 goals and 11 direct assists, his draft value has fallen. Mostly due to the fact he is not going to get the same opportunities in the pros as much of his offense was based on set plays and freedom to roam and he will need to greatly improve his defensive play if he wants to make an impact in MLS.